For other institutions called "Cumberland College," see Cumberland College. For the school in Williamsburg, Kentucky, see University of the Cumberlands. The university was founded by the Cumberland Presbyterian Church in 1842 and received its Tennessee State charter in 1843. In 1847 Cumberland Presbyterian church leaders added a law school, the first in Tennessee and the first west of the Appalachian Mountains, and in 1854 a school of theology was begun. From its early years, Cumberland University maintained a reputation for high-quality education. The Cumberland School of Law at one time was said[ by whom?] to have had more of its alumni elected to Congress than any other in the South. The Civil War nearly destroyed Cumberland University. University Hall was burned to the ground by Confederate forces under the command of General Joseph Wheeler. A Cumberland student wrote on a ruined Corinthian column the Latin Ex Cineribus Resurgam (From the ashes I will arise). The university thereafter adopted the mythical phoenix bird as its symbol. By 1866, just one year after the war's end, all departments were again operating in various locations in the town of Lebanon. Cumberland University moved to its present campus location in 1892. The university fell on hard times during the Great Depression, as did most small private colleges. After World War II, Cumberland experienced several changes in sponsorship and programs. In 1946, The Tennessee Baptist Convention assumed control of the school, ending a century of operation by the Cumberland Presbyterian Church. In 1951, the Tennessee Baptists closed the College of Arts and Sciences and operated only the School of Law. In 1956, the Board of Trust secured an amendment to the Charter and changed Cumberland to a private, independent corporation. 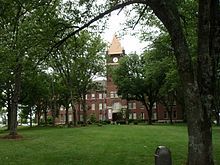 The College of Arts and Sciences was reopened as a two-year junior college, known as Cumberland College of Tennessee. In 1962, the assets of the School of Law were transferred to Howard College, now known as Samford University, in Birmingham, Alabama. The Board of Trust expanded the academic programs of the junior college in 1982, returning Cumberland to a four-year, degree institution. It resumed the old name of Cumberland University. Since then, Cumberland has expanded its academic program to include new majors and specialized student-learning opportunities. Cumberland University believes that a broad education, based in the liberal arts, is the best foundation for a lifetime of learning. Students from every state and from many foreign countries now[ when?] attend Cumberland. Its alumni include 14 governors, more than 80 members of the United States Congress, two Supreme Court justices, three United States ambassadors, and one United States Secretary of State ( Cordell Hull, known as the "father of the United Nations"). The trustees sold the School of Law and its assets in 1962 to what is now Samford University in Birmingham, Alabama. The law school continues to operate there. Cumberland University teams, nicknamed athletically as the Phoenix, are part of the National Association of Intercollegiate Athletics (NAIA), primarily competing in the Mid-South Conference. The Phoenix formerly competed in the TranSouth Athletic Conference. Men's sports include baseball, basketball, cross country, football, golf, soccer, tennis and wrestling; while women's sports include basketball, cross country, golf, soccer, softball, tennis and volleyball. Cumberland football began on October 26, 1894 with a 6–6 tie with Peabody and finished that first year with a 2–1–1 season record. The early days of Cumberland football were very promising. The pinnacle of the early days of CU football was the 1903 season that began with a (6–0) win over Vanderbilt then a (0–6) loss to Sewanee and continued with a five-day road trip with victories over Alabama (44–0) November 14, 1903, LSU (41–0) November 16, 1903, and Tulane (28–0) November 18, 1903. Cumberland would play a postseason game against Coach John Heisman's Clemson team on Thanksgiving Day that ended in an 11–11 tie and a record of 4–1–1  which gave Coach A.L. Phillips and Cumberland University the Championship of the Southern Intercollegiate Athletic Association. The 1916 game against Georgia Tech is famous as the most lopsided-scoring game in the history of college football, which was a 0–222 loss for Cumberland University. In addition, Cumberland achieved a top-ten finish at the National Collegiate Cycling Association's National Championship, its women's basketball team finished as NAIA National Tournament Runner-Up in 2007, and Cumberland achieved a National Tournament appearance for the No. 17-ranked Men's Tennis Team in 2007. The men's basketball team also earned success in the 2008–2009 basketball season earning another trip to the National Tournament. For the 2008 season, CU's football earned a share of the Mid-South Conference West Division. Memorial Hall at Cumberland University. The school's alumni include more than eight congressmen and thirty college presidents. Cordell Hull, Secretary of State under President Franklin Delano Roosevelt from 1933 to 1944. Maecenas Eason Benton, U.S. Representative from Missouri, 1897–1905, and father of famous painter, Thomas Hart Benton. Robert M. Rainey (1882–1971), Oklahoma judge and member of state Supreme Court. Cale Young Rice, playwright and poet. Laban Lacy Rice, noted educator and writer, former president of Cumberland University. Myles Horton, educator and social activist, graduated in 1928. ^ Cumberland University Graphic Standards Manual (PDF). Retrieved 2016-06-12. ^ a b c d "Lebanon, Tennessee: A Tour of Our City" (PDF). Lebanon/Wilson County Chamber of Commerce. Archived from the original (PDF) on June 15, 2007. Retrieved February 5, 2007. ^ "Sherry's Run - To Benefit Those Affected by Cancer - Lebanon, TN". www.sherrysrun.org. Retrieved 10 April 2018. ^ "Cumberland Historical Scores". www.jhowell.net. Retrieved 10 April 2018. ^ Langum, David J. From Maverick to Mainstream: Cumberland School of Law, 1847–1997. p. 95. ^ "CU Becomes Provisional Member of GMAC". cumberland.edu. Retrieved 10 April 2018. ^ "Division II Admits its 300th Member". ncaa.org. Retrieved 28 September 2015. ^ "CU athletics launches new nickname". The Wilson Post. Retrieved 4 January 2016. ^ TN, Streamline Technologies | Nashville,. "Women's Soccer | News | Official Site of the Cumberland University Athletics". GoCumberlandAthletics.com. Retrieved 2018-02-12. ^ "Arkansas Governor Jefferson Davis". National Governors Association. Retrieved August 17, 2012.